“After successfully damaged 2000 notes within 2 years Sardar Statue cracking in 2 weeks” Three close-up pictures of the recently inaugurated Statue of Unity are being circulated on social media. On these pictures, certain sections of the statue have been highlighted with a blue outline. Within the areas marked by the blue outline, one can see white markings. These markings are claimed to be cracks that have been developed on a statue that was inaugurated with much fanfare on October 31, 2018. The above claim has also been made repeatedly using the Hindi translation of the aforementioned text in English, “2 साल में 2000 नोट सफलतापूर्वक क्षतिग्रस्त होने के बाद सरदार मूर्ति 2 सप्ताह में क्रेक“. Since the inauguration of Statue of Unity, the statue has been visited by over a lakh visitors. Alt News looked up publicly available photos and videos of the Statue Of Unity on Instagram and found multiple close-up shots of the statue. In the Instagram video below, which has been shot from near the base of the statue, as the camera pans upwards, one can see many white markings, similar to the ones in the viral images. It can also be seen that these white markings are at places where different individual blocks have been joined. A similar observation about the blocks and the white markings can be made in this video shot by AajTak from near the feet of the Statue. At 0:21 into the video, the camera pans upwards to show the markings along the joints of the blocks as seen in the above Instagram video. The AajTak video was shot on the day of the inauguration of the statue. Therefore, the suggestion that these white markings were formed 2 weeks post the unveiling of the statue is also false and misplaced. 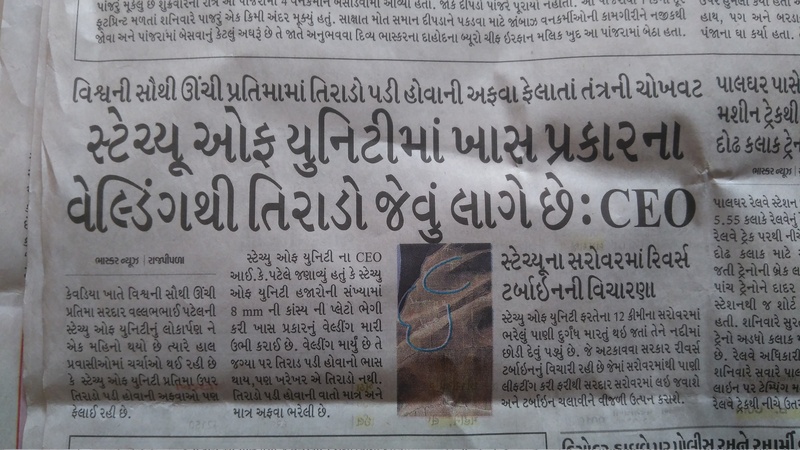 IK Patel, the CEO of Statue of Unity, in a statement to Gujarati daily Divya Bhaskar stated that the statue consists of thousands of metal plates made out of a bronze alloy which have been welded together. He stated that a special type of welding has been used for this purpose, which gives the illusion that these are cracks. He further stated that the claim that there are cracks in the statue is mere rumour-mongering. During the construction of the statue, the official website of Statue of Unity posted updates about the status of construction. In the image below, retrieved from the project status page, one can see the individual blocks that form the statue. In yet another image posted on the project status page, the statue can be seen being pre-assembled from individual blocks. Thus, the assertion on social media that the white-markings seen on the Statue of Unity are structural defects or cracks is false. Due to the sheer size of the statue, it has been assembled from individual blocks which have been welded together using bronze alloy metal sheets and the welding gives a false impression that these are cracks in the statue. Recently, a photoshopped picture of a poor family sitting near the Statue of Unity was circulated. Further, a 2008 statue of Sardar Patel by late Gujarat sculptor Jasuben Shilpi was also passed off as Statue of Unity.